Whenever we search for work from home jobs on the internet, we get results demanding registration fees. I often ponder upon, are there any free online jobs that we can do without investment? Or getting trapped into any kind of scams? In my journey so far, I have found that there are in fact plenty! If writing is your passion, this can be the best work from home option with a rewarding payment. Select projects you can work on and apply. Once you deliver the project on time, you will get paid. How to start without investment? You can register with popular sites providing freelance work. In that case, you don’t need to provide bank details to the person providing the project. The site/company takes all these responsibilities of security. And yes, no question of investment. If you love to teach, no option can be better. Teach via video/audio, give assignments, prepare question papers. This can be done by students too. Online teaching is a work from home option that most of the times do not require registration fees, or you may be asked a minimal amount. Convert ideas into attractive visual forms that can captivate a customer at first sight. All you need to make is a free account with gig websites like Fiverr.com, freelance.com, upwork etc. Then, work from the comfort of your home and get paid for each project. This is a creative job that too without investment. If you know two or more languages, this can be an easy work from home option. All you need is to write the same thing in a different language. There is no way of asking for registration fees. All you need is good contacts so that you keep getting projects. Companies need videos to promote their products or services. You can make such advertisement videos and earn working remotely. You need to register on the gig websites or be active in the startup communities. Pro Tip: Want to remain updated for Online Jobs? Follow this post to get regular job alerts. If you can enhance the sale of a product using your own marketing skills, you can get paid for each by using the link you provided. Online shopping sites have the option of affiliate marketing. You can register with these companies without any cost and start earning money independently from home. Do you know how to build apps? Use your knowledge to build fun and useful apps. Place ads and start to earn. As you are making your own app, all you will need is initial investment for hosting the app on the server and some basic cost. One alert, placing too many ads can ruin your effort. Follow a strategy and excel. Also read: 17+ Business Ideas For Women through which you can actually make good money. Virtual assistance can be provided at a personal level or for assisting a small business. To assist someone working remotely, you may have to plan events, send business emails, schedule meetings, book appointments etc. All you need is a good contact in the business or startup world and you will get a good number of paid work. Converting the voice in an audio or a video into a written document is transcription. There are different types like business transcription, legal transcription, medical transcription etc. The company provides you with an audio or video. You have to listen to it (in case of audio) or watch it (in case of video) and pen down the voice recording. It can be a speech, interview or anything. There is no investment required. Companies need people who can create good content related to their products or services to attract their customers. You have to share the details in a creative way on social media platforms like Facebook, Twitter, Instagram. You only need good communication skills because you may have to respond to customer queries on social media platforms and no investment is required. Checking if the requirements of the customers of a particular company are being fulfilled or not, managing a team of customer service providers, directly connecting with customers, analysing the data history of the customer with the company and working to improve the customer-company relationship are some of the main works a customer service manager does. You may sometime need to invest in a certification or course. Other than that, there is no investment required. Companies connect clients and consultants. A part of your fees goes to the company providing the space. You can start on your own website too. 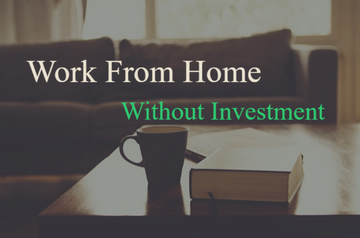 This can give you full control over your work that too from the comfort of your own home and without any kind of investment! Can you create useful content and post them regularly? Blogging can be a great way to earn all by yourself. You have to keep your blog updated with new content at regular intervals. After you get targeted visitors, you can start earning. There are a lot of ways to earn from a blog like Google Adsense, affiliate marketing, writing about other products and reviews etc. These things need no investment. But if you opt for a paid blog, you need to pay that monthly fee. These are only a few among the huge number of work from home jobs available without investing money. Some companies might ask for a registration fee. But why? Why do companies put a registration fee? If you have to get their sewing machine suppose, you have to pay for it. But pay cash on delivery only. The set of skills needed is not known. They can provide training before employing you. But keep in mind, even big brands do not need employers to invest. For data entry jobs, this can be valid. Check well before paying. Research all about the company thoroughly over the internet. Most of the jobs asking for money are unfortunately scams. You should never pay a fee for pre job training also. If the company is genuine they are bound to employ you without investment. What are the red flags to look for to be safe from Scams? The highlighted creatively written words are WORK FROM HOME. For example, you can see a headline “WORK FROM HOME, WEEKLY PAYMENT”. No genuine company will do that. Why? Think of yourself as an employer. 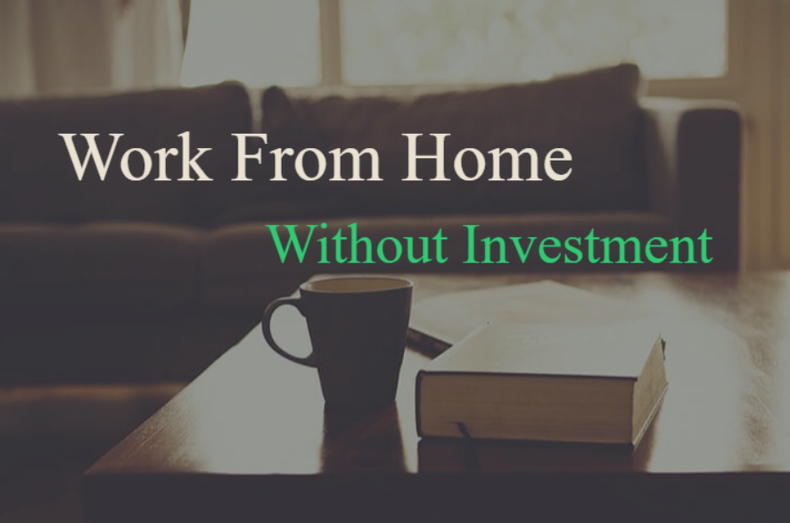 The work from home option can attract a lot of people but the actual important thing that matters is the requirement of the position. They won’t want all random people to get attracted. They need employees with specific qualities and skills. A huge sum of money is promised as the main headline with work from home. Chances are, they will ask for investment right after you apply. If the company is genuine, they won’t declare an amount of money as if they are giving away the money. Less work, more money kind of offers. So are they keen to give you more money in exchange for a simple small amount of work? Do not fall prey. They won’t start without investment though. Spelling and grammar errors in job ads. A huge NO-NO in this case. Of course, they are fraudsters. If the person providing the job gives an unprofessional email ID, it is a red flag. Companies use their own domain address. Employers use that ID to connect with job seekers. They do not use their personal email ID. Use your instincts. Research well before providing bank details. Look for reviews. Try to opt for jobs without investment. If you decide to pay a registration fee, do that after researching well. There are many websites to find reviews and ratings. She has been a book worm since childhood. She loves to travel and write stories of people from different cultures and lifestyles. I'm a retired RN, love to cook, sew, quilt, and crochet. My husband passed away 7 years ago, and I have time on my hands. I would love to work from home now. Please help me. I am an editor in medical transcription with DU status . Now need a job to work from home. Hello mam I m interested in above this jobs, kindly suggest me.how can do this. Hi Shiny, I really admire your dedication to help women in every possible way. Hope we have more inspiring women like you. God bless. Great article BTW. Hi....I want to do that work...pls tell me..